Resistance bands may call to mind little old ladies doing chair exercise routines to the sounds of the Golden Oldies, but don't scoff at the giant rubber bands just yet -- they're actually a legit piece of workout equipment appropriate for all levels of fitness. What sets resistance bands apart from other strength-training tools like dumbbells and barbells (aside from their obvious portability) is that they don't rely on gravity to provide resistance. So, for instance, when you do a biceps curl with a dumbbell, the resistance is only present in the vertical plane, where gravity is pulling downward on the dumbbell. If you've ever done a biceps curl, you know what I'm talking about; there's a point during the upward curl where the exercise gets noticeably easier as you pull the dumbbells to your shoulders. Resistance bands, on the other hand, provide continuous and increasing resistance throughout a full range of motion as the band stretches. There are no breaks at the apex of each movement; in fact, the apex is where the exercise is the hardest. This means if you're using sufficient resistance, you can actually put your body through a serious strength-training routine that can garner major results. Think I'm full of it? Grab a resistance band or two and try this four-move, full-body workout on for size. Hold opposite ends of a resistance band in each hand, with the band looped around your back. Bend your elbows, positioning your hands at your shoulders, palms pointing away from you. Adjust the band so that in this position it's taut around your upper back, but not tight. With your feet together, bend your knees and press your hips back to enter a mini squat. This is your starting position. From here, hop your feet out wide laterally, as if performing a traditional jumping jack, but as you do so, press your arms straight forward, extending your elbows from your chest in a chest press. Immediately hop your feet back to center as you bend your elbows and bring your hands back to your shoulders. Continue this exercise as fast as you can. Stand on the center of a resistance band, feet shoulder-width apart, weight in your heels, with one end of the band in each hand. Bend your elbows to draw the resistance bands to your shoulders, palms facing forward. From this position, press your hips back and bend your knees, lowering your glutes toward the ground. When you've squatted as low as you comfortably can, press through your heels and extend your knees and hips to return to standing. As you do so, press your arms straight over your head as you engage your shoulders and extend your elbows. This is one full rep. Bend your elbows to bring your hands back to your shoulders before continuing the exercise. Loop the center of a resistance band around a pole or another fixed object. Stand facing the pole, your arms extended in front of your chest, with one end of the band in each hand. Step backward until the band is taut, not tight, and position your feet shoulder-distance apart with your weight in your heels and your knees slightly bent. This is your starting position. From this position, take a large step back with your right foot, planting the ball of your foot on the ground. Bend both knees and lower your back knee toward the ground. As you do so, bend your elbows and engage your back, pulling against the band's resistance to draw your hands to your chest. 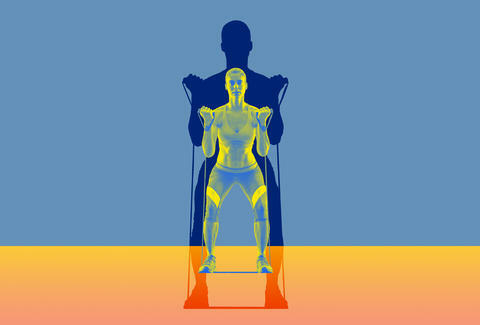 Squeeze your shoulder blades together as you perform the row. Reverse both movements, stepping your right foot back to the starting position as you extend your arms. Repeat to the opposite side and continue. Stand slightly behind and to the right of a sturdy pole or another fixed object and loop the center of a resistance band around the pole at a height higher than your head. When you extend both arms diagonally to the left over your left shoulder and grip both ends of the band in both hands, the band is taut, not tight. Position your feet slightly wider than shoulder-width apart and bend slightly at the knees. This is your starting position. Keeping your arms relatively straight throughout the exercise, use your core and hips to pull the resistance band in a sweeping diagonal movement across your body toward your right hip, allowing your torso and hips to turn to the right as your left knee bends and your left foot pivots toward the right, as needed. Carefully reverse the movement, returning to the starting position before continuing. Now that you have the moves down, it's time to get to work. Take five to 10 minutes to warm up with a simple walk or jog before diving in. Each full circuit takes five minutes, including a 30-second rest period at the end of the circuit. Aim to complete the full routine three to six times, for a 15- to 30-minute workout. Laura Williams is an exercise physiologist and fitness writer who swears by resistance-band workouts when traveling. Find her on Twitter: @girlsgonesporty.